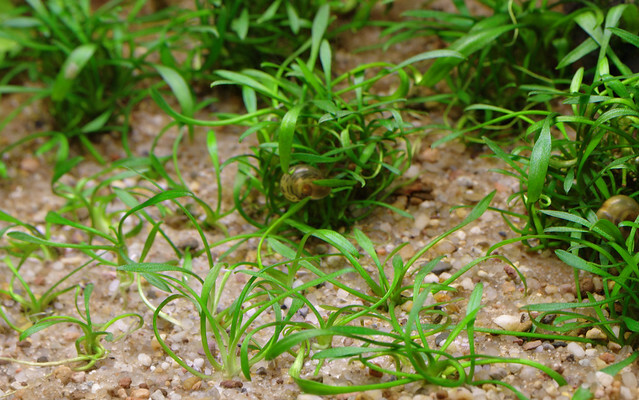 When I first received the Cryptocoryne parva in a tub, the roots were relatively short and matted, so I separated it into only 10 clumps, instead of separating all the plants into individual ones. Now that the roots have had time to grow, I decided to separate a couple of the clumps into individual plants. I pulled up two of the clumps in the front-left area of the Crypts and found the roots to be around 30-50 mm long for most of the plants. I started by pulling apart as many plants as I could by hand. The rest I had separate by cutting the rhizome into two or more parts with a pen knife. This can be a bit laborious with such small plants as C. parva, and a lot of care is needed to avoid damaging the roots. Once I had all the plants separated, I planted individual plants approximately 15-20 mm apart and added a root tab underneath the area. I also added a root tab under the C. wendtii ‘Mi Oya’, one under C. wendtii ‘green gecko’ and another under the Pogostemon helferi. It has now been five days: none of the C. parva plants have come up and there have been no problems. All the plants are improving since I added the root tabs, especially so the Limnophila aromaticoides and Hygrophila corymbosa ‘Angustifolia’. I have added a two more tabs under the Vallis as the older plants are still looking poor, although the runners are healthy. I received a new batch of 50 tabs of Sera’s florenette A so 4 of those went under the Hygrophila corymbosa var. siamensis, Vallis., Echinodorus tenellus and Cryptocoryne beckettii ‘petchii’ yesterday, and another 16 were dispered under some of the other plants today (Hygrophila polysterma, Crypt. wendtii ‘brown’, Echinodorus bleheri, Eichhornia azurea, Pogostemon erectum, Crypt. wendtii ‘green gecko’, Pogostemon helferi). I also noticed that the keyholes have spawned again and because as usual, I do not believe that they will do well, I removed 10 eggs using a paintbrush. Even as I was removing the eggs, the Melanoides tuberculata ((Malaysian trumpet snails) were already trying to eat the rest. One unusual thing did happen though: the male keyhole bit me, which has never happened before, even when they were breeding. On closer inspection, I am not sure if the female spawned with her usual mate or one of the younger ones because the older male and the bigger of the younger two now look almost identical.